How To Set The Default Signature In Outlook? The signature in Outlook 2016 is the text that appears after the main message. 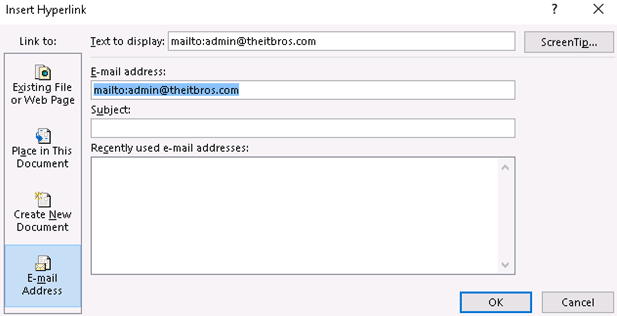 In Outlook email signature you can specify your name, phone number, address, contact details or any other information. In addition to the name and contact phone, the signature can contain a picture, for example, the company logo or your photo, as well as a link to your site. By creating an Outlook signature template, you can insert each email by clicking the special button on the shortcut bar, or enable the automatic addition of your contact info to every message you send. The signature is created quite simply in the settings of the mail client. In our instruction you can read on how to create a new one or change Outlook signature. 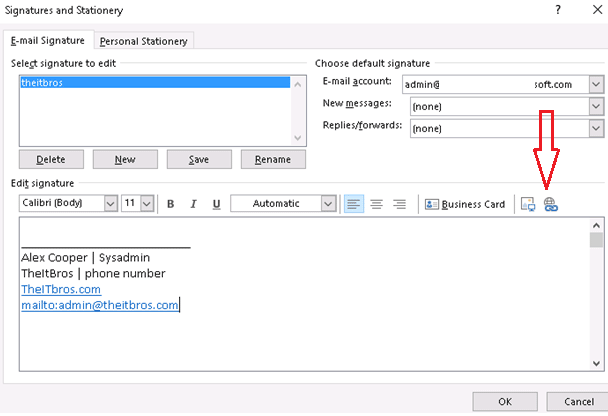 To create a signature in Outlook 2016, open the email program settings (File -> Options menu). In the Outlook Options window, select Mail on the left. Now find the Signatures button and click it. 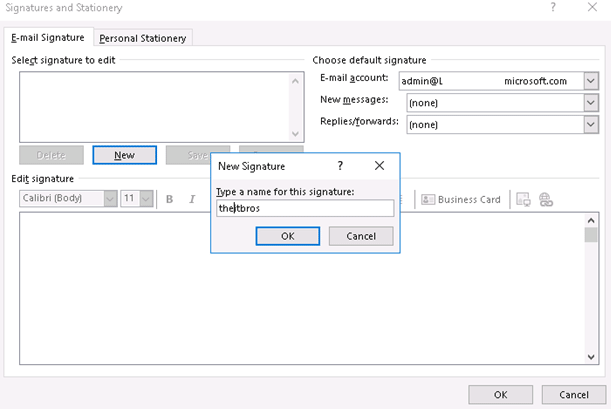 The window for creating and setting up signatures in Outlook 2016 opens. Click the New button and specify the name of the new signature. 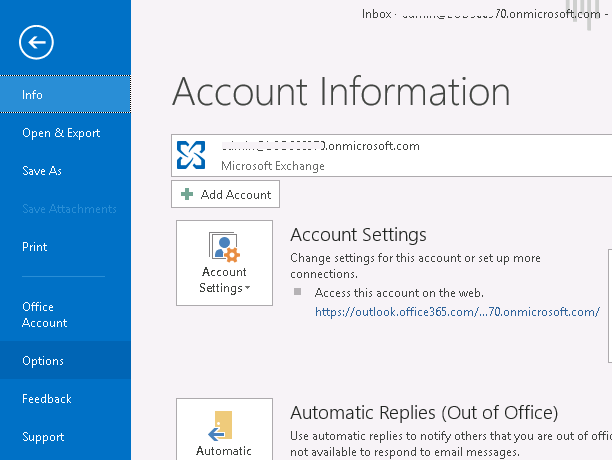 Now you can start editing the Outlook signature. You can specify your name, surname, position and company name. For example, we created such a signature. The red arrow in the screenshot shows a button with which you can insert a picture or link into the signature. A link can be an email address for the answer. In essence, the recipient can answer the letter simply by pressing the Replybutton in Outlook itself, but it is a sign of good tone that there is a reply address in the letter itself. Click the insert button link and select the link type E-mail address. Enter your e-mail address. Outlook itself will append the text “mailto” at the beginning. The signature is ready, click Save button. 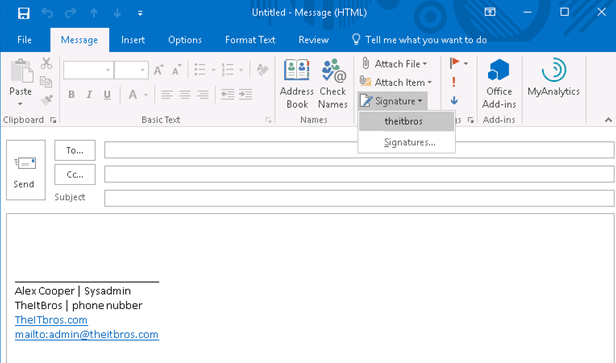 In Outlook 2016, you can create multiple email signatures. In this case, one of them will be the default signature – it will be automatically added to all new messages. If you need to use a different signature, you must select it manually. To specify a default signature, you must select it from the list in the New messages field. This signature will be used when creating new letters. 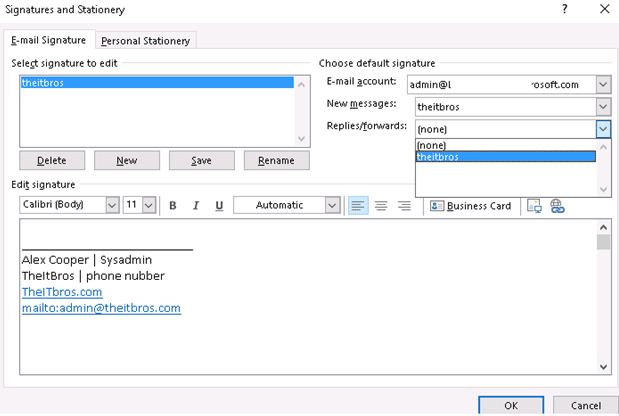 If several mailboxes are configured in Outlook, you can specify for which of them this signature will be used as default in the E-mail account field. You can also select your signature in the Replies/Forwards list, then the signature will be inserted not only in new letters, but also when replying to the letter or forwarding the received message to other recipients. 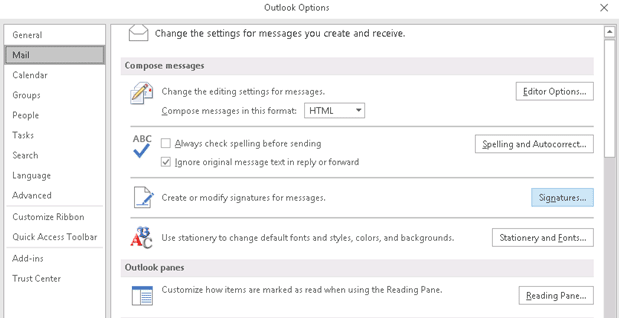 The Outlook signature setting is finished, click OK and try to create a new e-mail message. The default signature will be automatically inserted at the end of the message. You can select another signature by using the Signatures button. The file with the Outlook signature template is stored not in the mailbox, but on the user’s computer. You can find it in the C:\Users\your_username\AppData\Roaming\Microsoft\Signatures folder. 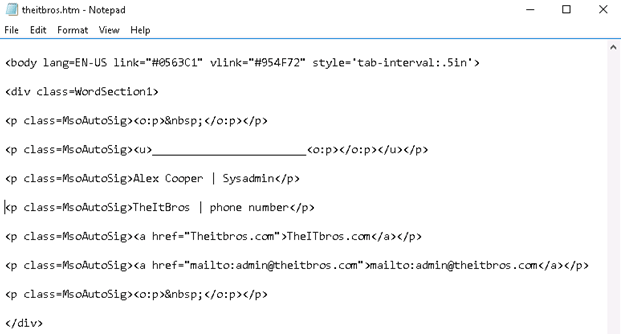 In this folder, the signature is stored in three different file formats: html, rtf and txt. The file type is selected automatically depending on the type of email being sent. You can manually edit these files by using any text editor.